A key aspect of working with ArcGIS is documenting the content and project items you create and use—your maps, projects, geoprocessing models, geodatabase datasets, and so on. Information that describes items is known as metadata. Metadata is saved with the item it describes—in the geodatabase for geodatabase items, in the project for project items, on the file system for file-based items, and so on. Once created, metadata is copied, moved, and deleted with the item when it's managed by ArcGIS. You can record information that is important for your organization to know about an item in its metadata. When care is taken to provide good descriptive information, you can find items with a search, and evaluate which item in your search results is the correct one to use. You can improve communication and have confidence in decisions based on an item's geospatial information. You can archive projects knowing they can be recovered, used, and evaluated in the future. It fits on one page. It allows you to provide the information used by the ArcGIS platform. It's indexed and available for searching. It's visible on the item details page when published to ArcGIS Online or an ArcGIS Enterprise portal. While ArcGIS Pro is set to use the Item Description metadata style by default, other metadata styles are available that provide access to more of an item's metadata content. Metadata specialists and others who want to view and edit more information should choose a different metadata style. Metadata is available in the Catalog pane and the catalog view to help you learn about an item and decide if you want to use it. Its content is updated automatically when you view it in the details panel in the catalog view; metadata is created for the item if it doesn't already exist. ArcGIS extracts the item's properties and records appropriate information in its metadata. For example, the extent and count of a feature class's features are current when you look at its metadata, even if new features were recently added. This process is known as synchronization—values in the metadata are synchronized with the properties of the item. A pop-up is available in the Catalog pane that shows an item's descriptive title, type, location, and modification date. Portal items can show additional information, such as the item's owner, that local and network items can't show. Local and network items can show more information, including a thumbnail and tags if More Detail is checked on the View tab on the ribbon. However, browsing items is slower because information is being collected from each item's metadata. A pop-up is also available in the catalog view that shows the location of folders, databases, and toolboxes only to indicate an item's location. It doesn't appear for individual datasets, maps, or other items. Hover over an item in the Catalog pane. A pop-up shows information describing the item. Hover over a folder, database, or toolbox in the catalog view. A pop-up shows the item's location only. On the View tab on the ribbon, in the Options group, check More Detail to see additional information in the pop-up. Uncheck Show Pop-ups to hide the pop-up. In the Catalog pane, click the Menu button and uncheck Show Pop-ups. In the catalog view, on the View tab, in the Options group, uncheck Show Pop-ups. Similar to the pop-up in the Catalog pane, the details panel on the browse dialog box shows the descriptive title, type, location, and modification date for all items, and the owner for portal items. If More Detail is checked on the View tab on the ribbon, the item's thumbnail and summary will also appear if this information is available for the item. Browse to a location on the browse dialog box. An example of the browse dialog box is the dialog box that appears when you click the map's Add Data button. Click the Show/hide details panel button in the upper right corner of the dialog box. Click an item in the contents list. A brief version of the item's metadata appears in the details panel. You can see metadata describing maps, map layers, and stand-alone tables using their Properties dialog box; it's available from the Contents pane. By default, new map layers and tables created by adding a dataset to the map reference the metadata associated with the dataset. That is, when you add a feature class to a map and view the layer's metadata, you'll see the feature class's metadata. This can be a good idea when someone else manages the dataset and you're not familiar with it. When you add an existing layer to a map and the layer has a basic description or full metadata, this information is transferred to the new ArcGIS Pro map layer. Similarly, when you import a map, descriptions or full metadata for the original map's layers is included in the new map layer definitions. These layers will be set to use their own metadata instead of referencing the dataset's metadata. In the Contents pane, right-click the map or select one or more layers or tables in the map and right-click the selected layers or tables. A brief version of the item's metadata appears on the tab. To see full metadata instead, use the catalog view. For map layers and stand-alone tables, click the drop-down list at the top of the tab. Click Show metadata from data source (read-only) to reference the dataset's metadata. Click Layer has its own metadata or Table has its own metadata to see metadata stored in the project that describes the layer or table. To view full metadata for a map, or for layers and tables in the map, right-click the map, layer, or table in the Contents pane, and click View Metadata. You can see metadata content for an item or for the project in the details panel of the catalog view. To see more or less information, choose a different metadata style. You can browse in a map and see metadata for its layers and tables. The catalog view honors the metadata setting for map layers and stand-alone tables. That is, if the layer is set to reference metadata from its dataset, the dataset's metadata will be displayed in the details panel. You can only change this setting on the Properties dialog box for the layer or table. On the View tab on the ribbon, in the Windows group, click Catalog View . The catalog view appears in addition to the Catalog pane. You may want to hide the Catalog pane while you work in the catalog view. If the details panel is not open, on the View tab on the ribbon, in the Options group, check Show Details. Browse to a location in the Contents pane or using the Location control in the catalog view. Click an item in the catalog view's contents list. The item's metadata appears in the details panel. To see a project's metadata in the catalog view's details panel, click Project in the Contents pane. Only metadata in ArcGIS format is visible in the details panel in the catalog view, on the browse dialog box, in the Catalog pane's pop-up, and on the map or layer Properties dialog box. If you receive a stand-alone metadata document that contains standard-format metadata content, a message appears when you try to see its content in the details panel of the catalog view. The message indicates the format of the metadata document if it's recognized. You can view the document's content in a browser. Click the standard-format metadata document in the catalog view. 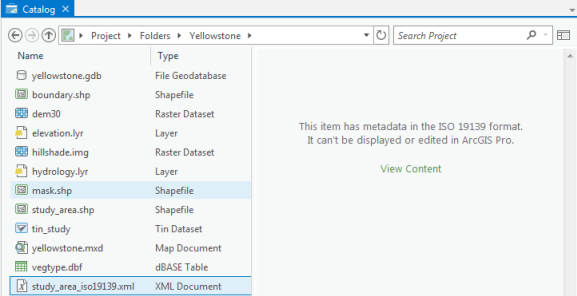 A message appears in the details panel indicating that the metadata content can't be displayed in ArcGIS Pro. Click the View Content link in the details panel. A new browser window appears, displaying the contents of the metadata document. If the document contains FGDC CSDGM-format metadata or ESRI-ISO-format metadata, for example, created in ArcGIS Desktop 9.x, the metadata content can be upgraded to the ArcGIS metadata format. If the document's format is supported by ArcGIS Pro for conversion to the ArcGIS metadata format, you can import its content to an item. You can edit an item's metadata if you have permission. For items on the file system, you can only edit metadata if you have write access to the location where the item is stored. For items in a geodatabase, you can only edit metadata if you have privileges to edit the data. For an enterprise geodatabase, metadata is only supported for the default version of the geodatabase; items can't have version-specific metadata content. For portal items, you can only edit metadata for items you own. It may take some time to complete an item's metadata. You can save your changes and stop editing at any time and come back later to finish your work, even if required information is missing. If you save and close your project with a metadata view open, you can start editing metadata again immediately the next time the project is opened, as long as the item remains available and your privileges associated with it haven't changed. The metadata view will open to the same page you worked on previously. Several metadata views can be open at the same time. If you lose track of which metadata view is associated with which item, hover over the name of the item at the top of the Contents pane; a pop-up will show the item's type and location. Learn about best practices for documenting items. You can edit metadata that describes a map, and a layer or table in a map, using its Properties dialog box. If many layers or tables are selected, the changes are applied to all selected layers or tables. When a layer or table in a map references the dataset's metadata, the metadata is read-only. To edit the dataset's metadata, you must browse to and select the dataset in the catalog view. You may need to add a folder, database, or server connection to the project to access the dataset in the catalog view. Similarly, you may need to change the active portal to access the portal item associated with a layer or table. When it's time to share your work, the best practice is to provide information that specifically describes the information provided by the layer or table in the map. This information is transferred to the portal item. For example, describe queries applied to the dataset and the fields available in the map in the metadata for a layer or table. You can copy the dataset's metadata to the map layer or table first; then tailor the metadata content. Add any restrictions limiting how the layer or table should be used. View metadata for the map, layer, or table whose metadata you want to edit on its Properties dialog box. For a map layer or table, click the drop-down list and click Layer has its own metadata or Table has its own metadata. For a map layer or table, click the Copy button to copy the data source's metadata to the layer or table. The copied metadata overwrites all existing metadata content for the layer or table, including any thumbnails that may be present. However, if the data source has quality metadata, this can be used as a quick start for documenting a layer or table that will be shared with others. Describe the map, layer, or table. Because maps, map layers, and stand-alone tables are saved in the project, metadata updates for these items are not permanent until the project has been saved. Metadata for all project items is stored in the project along with those items. To edit full metadata for a map, or for layers and tables in the map, right-click the map, layer, or table in the Contents pane and click Edit Metadata. If the layer or table is set to Show metadata from data source (read-only), a message will appear indicating the layer's or table's metadata is read-only. You must browse to and select the data source in the catalog view and edit its metadata directly. The updates to the data source's metadata will appear the next time you view metadata for the layer or table. You edit full, standards-based metadata for any item, including the project itself and a map's layers and tables, in the metadata view. To edit more or less information, choose a different metadata style. Click the item whose metadata you want to edit in the catalog view. Apply a metadata template to the item if you have one. On the Catalog tab on the ribbon, in the Metadata group, click Edit . The metadata view appears. The pages available for editing metadata are listed in the Contents pane. You can hide other panes while you edit metadata. Describe the item using the available pages. On the Metadata tab on the ribbon, click the appropriate button to save your changes. For maps, map layers and stand-alone tables, layouts, tasks, and other items stored in the project, click Apply and save the project. All changes made to the project since the last save are persisted, including your metadata edits. For the project itself, datasets, files, tools, and other items referenced by the project, click Save . The item is updated with the current metadata content. Your changes are saved, and you can continue editing the item's metadata. Preview your changes by viewing the item's metadata in the catalog view. When you're finished editing the item's metadata, close the metadata view. Each item is associated with an ArcGIS metadata document. A metadata style provides access to a set of elements in that ArcGIS metadata document, a set of rules regarding which of those elements must be provided, and a style sheet for displaying their content. The default metadata style supports providing the information used by the ArcGIS platform. Other metadata styles are associated with metadata standards and allow you to view and edit full metadata. Each metadata style has different rules about what information must be provided to assist you in creating metadata that complies with the associated standard. Choose the appropriate metadata style to satisfy your organization's requirements. If a project is open, click the Project tab and click Options. Start ArcGIS Pro, click Settings at the bottom of the start page, and click Options. Click the Metadata tab on the Options dialog box. Click the Metadata style drop-down arrow and click the style of metadata you want to use. The Metadata style drop-down list is unavailable if you're editing metadata for an item. Close all metadata views and change your Metadata style. Click the Back button to return to or open your project. If you were viewing metadata in the catalog view before changing your metadata style, the metadata display updates automatically to reflect the change.